Whilst the majority of Brazilian Pilseners, which make up 98% of the Brazilian beer market, can be dismissed as bland and watery, there are an increasing number of microbrews offering something a little different. One of them is brewed by Göttlich Divina and it is this week’s Brazilian Beer of the Week. Where purchased: Pão de Açúcar (also seen in larger supermarkets in São Paulo). 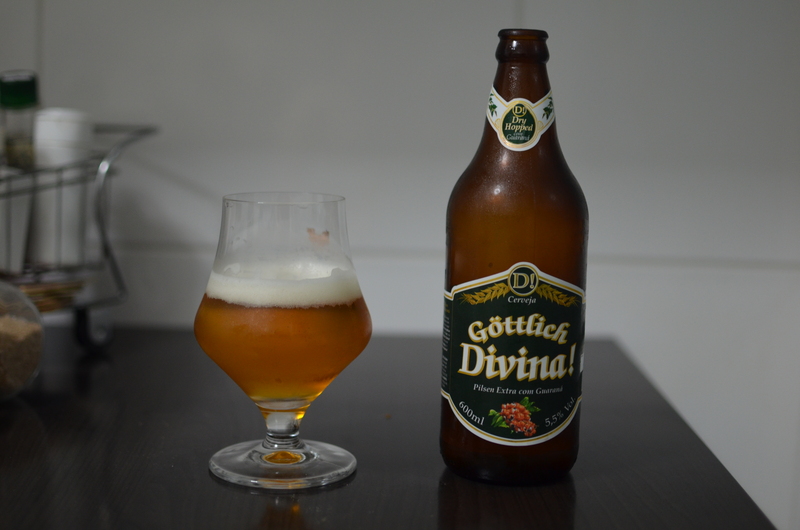 Background: Göttlich Divina beers are brewed in Joinville, a city in the state of Santa Catarina that was founded by German, Swiss and Norwegian immigrants. The beers were developed after the brewery’s founders visited the German monastery of Weihenstephan in 2007 – which dating from the year 768 is the world’s oldest brewery. After the visit they decided to incorporate Old World brewing methods with original ingredients from Brazil and around the world. One example of this can be found in today’s choice of beer, in which the process of Dry Hopping (adding hops to a beer as it ferments) has been used, although in this instance using Guaraná (a Brazilian fruit) rather than extra hops. I was quite excited about this when I bought it and expected it to have a very distinctive Guaraná taste. However, it’s flavour is actually quite subtle with the dry hopping process having the effect of leaving only a hint of fruit and citrus. Refreshing and slightly bitter. Lively, it pours with a clear, golden body and a nice white head, with a fruity aroma. the book is on the table’s Rating: It’s towards the higher-end of the Brazilian beer market and this is reflected by its price. However, given the extra attention paid to the ingredients and the brewing process it’s worth it. Importantly, it shows that Brazilian Pilsener doesn’t necessarily have to be bland and as cold as humanely possible in order to be refreshing.